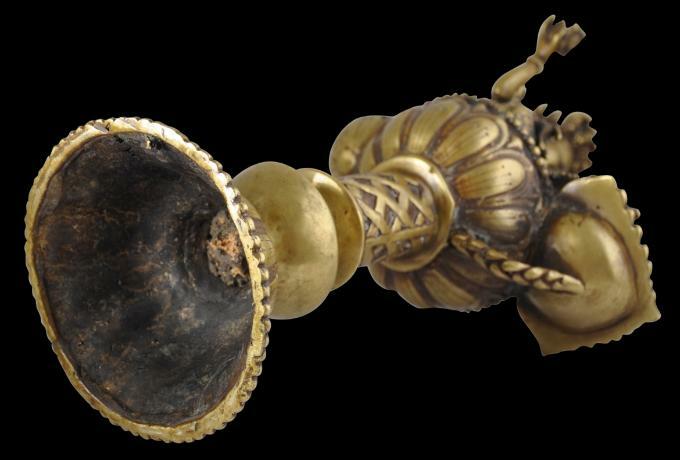 This beautiful oil lamp cast in brass using the lost wax process is from the Newar people of the Kathmandu Valley in Nepal. It has softened contours from use and handling and a honeyed patina. 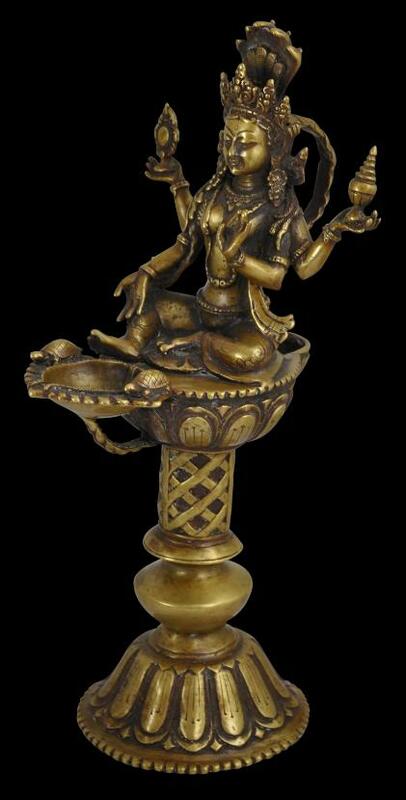 It shows a Nepalese version of the goddess Lakshmi, the goddess of wealth and light (hence the association with a lamp). 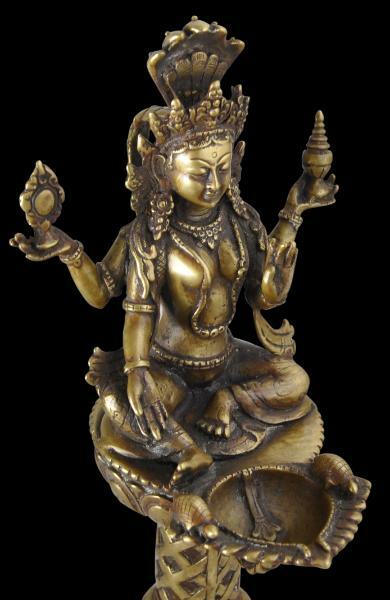 She is depicted seated with four arms. The front two are in the varada and abhaya mudra poses. 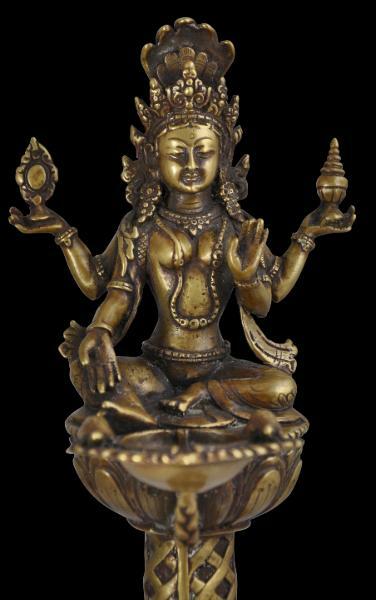 The back two hold the attributes she is often ascribed in Nepal: a mirror (darpana) and a vermillion pot (sinhamoo). Often she is accompanied by two dwarfs but on this occasion she is accompanied by two tortoises which sit on either side of the oil pan before her. She wears ample jewellery and a large Himalayan-style crown. 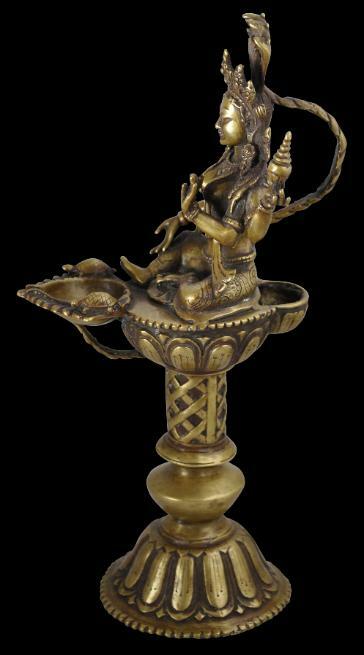 A multi-headed cobra rears over her head and its plaited body (which also seems to double as Lakshmi’s plaited hair) flares out from the back of the goddess’ head and serves as a handle for the lamp. 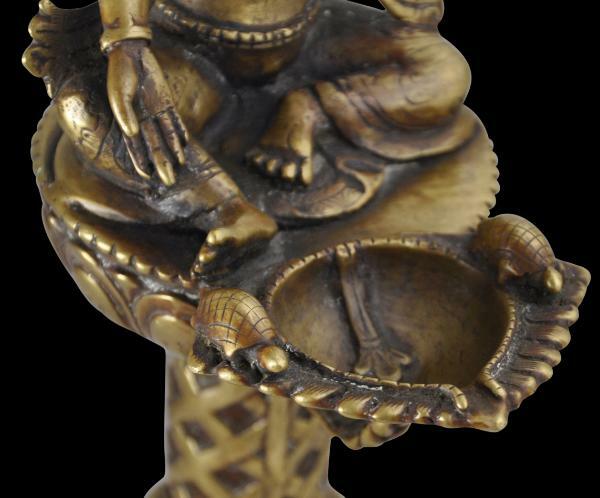 The back of the platform on which Lakshmi sits has an opening and the platform serves as a well for oil which the user would have ladled to the lamp pan at the front of the image when it needed replenishing. The platform and the base are cast with prominent lotus petals and the baluster stem of the lamp is decorated with a broad trellised design. Overall, this is a wonderfully sculptural piece. It is without repairs and damage and is particularly finely cast. Anderson, S., Flames of Devotion: Oil Lamps from South and Southeast Asia and the Himalayas, UCLA Fowler Museum of Cultural History, 2006. Lamps of India, Publications Division, Ministry of Information and Broadcasting, India, 1961. Short Description of Gods, Goddesses and Ritual Objects of Buddhism and Hinduism in Nepal, Handicraft Association of Nepal, 2000.